Please refer to our stock # 3278 when inquiring. 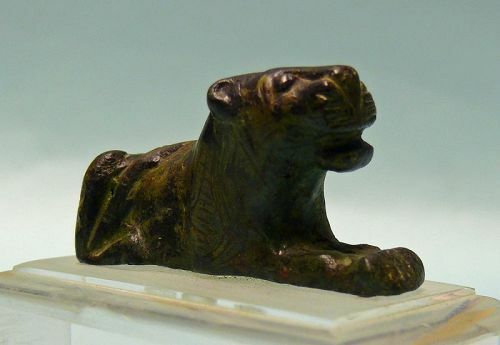 Roman Bronze Recumbent Lion, attachment, ca. 2nd - 3rd Century CE. Found in the Holy Land. In excellent condition, 1" x 2" x 5/8", on custom stand 2 1/2" high. Ex: Archaeological Center, LTD, Jerusalem. Lions have been widely used in sculpture to provide a sense of majesty and awe, especially on public buildings. Lions were bold creatures and many ancient cities would have an abundance of lion sculptures to show strength in numbers as well. This usage dates back to the origin of civilization. There are lions at the entrances of cities and sacred sites from Mesopotamian cultures; notable examples include the Lion Gate of ancient Mycenae in Greece that has two lionesses flanking a column that represents a deity, and the gates in the walls of the Hittite city of Bogazköy, Turkey. The "Lion of Menecrates" is a funerary statue of a crouching lioness, found near the cenotaph of Menecrates. The lion is by a famous Corinthian sculptor of Archaic Greece, end of the seventh century BC, and is now in the Archaeological Museum of Corfu.